Save the date! SABR will be returning to the Steel City for our 48th national convention on June 20-24, 2018, at the Wyndham Grand in downtown Pittsburgh, Pennsylvania. Registration information will be available at SABR.org/convention in early 2018. 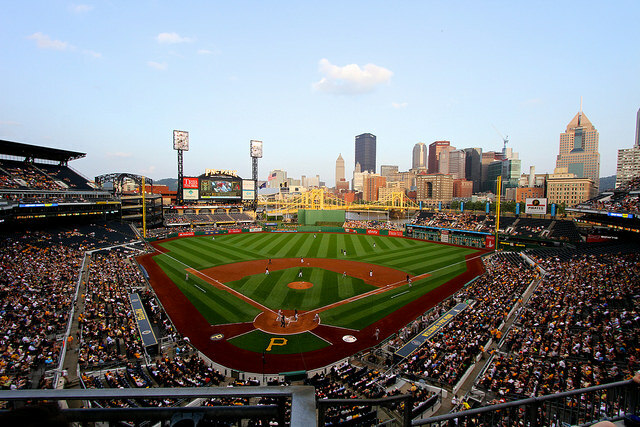 The Pirates are scheduled to play at home against the Arizona Diamondbacks that weekend. The Wyndham Grand is conveniently located within walking distance from PNC Park and a light rail station, many downtown cultural amenities, and right across the street from the picturesque 36-acre Point State Park where the three rivers converge. SABR 48 will be our second convention held in Pittsburgh and first since 1995. Our 25th annual convention that year featured a keynote speech from former Pirates manager Chuck Tanner and panel discussions commemorating the 1960 and 1971 World Series champions. Learn more about SABR's convention history by clicking here. SABR's 2018 national convention will be our 48th annual gathering; the organization's founding in Cooperstown in 1971 is counted as the first. For more information on the SABR convention, visit SABR.org/convention. This page was last updated September 12, 2017 at 10:11 am MST.